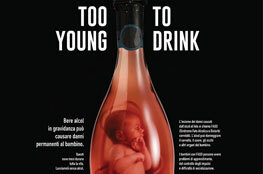 The launch of the #TYTD2015 campaign, created by Fabrica, the Benetton group’s communication research center, will take place on September 9, 2015, the International Fetal Alcohol Spectrum Disorders Awareness Day. publish and spread them in the social media and on the Web. The strength of this action is the viralization of the visual of the campaign in the Web community, by involving the highest number possible of people, theanks especially to the use of Facebook, Twitter and Instagram. 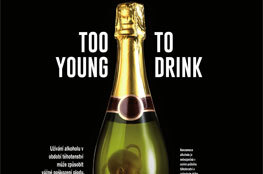 The hashtags of the campaign are #TYTD2015 #FASDay #FASD #tooyoungtodrink. 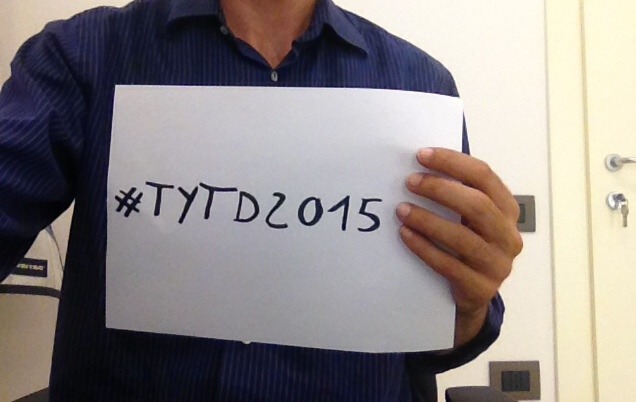 To participate, insert the hashtag #TYTD2015. The winners of the contest will be recognized as “Ambassadors of the #TYTD2015 campaign”. The range of harm to an unborn baby due to drinking during pregnancy is called Fetal Alcohol Spectrum Disorders (FASD). 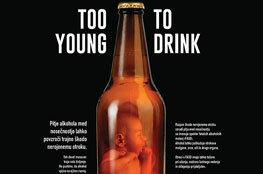 Alcohol can hurt the baby’s brain, heart, eyes, and other organs. Children with FASD can have a hard time learning, controlling how they act, and making friends. Drinking alcohol during pregnancy can cause lifelong harm to the unborn child.These nine months last a lifetime. When a pregnant woman drinks alcohol, so does her baby. 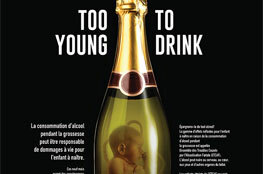 Alcohol is harmful for the baby: baby is too young to drink! How does alcohol affect the baby? Alcohol affects the baby’s growth, especially the brain. The baby may be smaller than normal and may cry a lot. As the child grows, it may be hyperactive or difficult, and have trouble learning in school. As a teenager, many of these youth drop out of school, cannot keep a job, and get involved in criminal behavior. Are all types of alcoholic beverages harmful? Yes, wine, beer, hard cider, aperitifs, alcoholic fruit drinks, spirits such as rum or whiskey or vodka can all harm the baby. 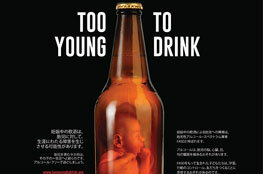 All types of alcoholic drink are harmful for the baby. There is no safe amount of alcohol or safe time to drink during pregnancy or when planning to become pregnant. Even a small amount of alcohol can be harmful. It is safest NOT to drink at all during pregnancy. Fetal Alcohol Syndrome (FAS) and Fetal Alcohol Spectrum Disorders (FASD) are names given to the problems a baby may have if the mother drinks during pregnancy. Alcohol can cause delayed growth, birth defects, and brain damage. A person with FASD faces lifelong challenges. Yes, by NOT consuming alcohol during pregnancy or while planning to get pregnant. My friend drank in her pregnancy and her child is healthy. Each pregnancy, child, and mother are different. It is better NOT to take the risk of harming the child. It is never too late to stop drinking. If you stop now, your baby will be healthier. I’m not pregnant and I drink. 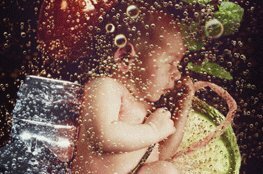 How can I avoid the risk of having a child with FASD in the future? If you don’t use contraceptives, or if you want to have a baby, stop drinking now. Alcohol makes it harder to get pregnant, and increases the risk of miscarriages. 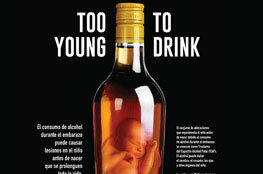 Alcohol is harmful to the baby from the moment of conception onwards. What can fathers do? What can friends and families do? What can all of us do? Fathers can support the mother-to-be by respecting her decision not to drink. Many fathers also stop drinking during the pregnancy. In our society, drinking often plays a great role in social life. Sometimes pregnant women feel pressured to drink, too. Friends and families should respect her decision not to drink, and should help her to avoid situations where she usually drinks, like parties and bars. It is the responsibility of all of us to support mothers-to-be. I think my child has FASD. Talk with your doctor or health clinic about your concerns. The child with FASD can benefit from a caring and structured environment, as well as from special help (for example, speech therapist or physical therapist). When you decide to have a child, you want it to be born healthy and live its life in the best way. The way in that a woman spends the nine months of her pregnancy is so important. We have to sensitize women, but also families and society as a whole, to the fact that drinking alcohol during pregnancy can harm the fetus. It is a very important thing. For this reason we have adhered to this initiative. The fact that, for your self-interest and for your personal pleasure, you can put in danger your child, who has no power and totally depends on you, is very serious. 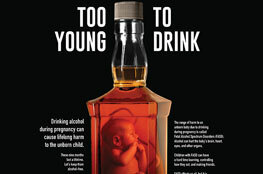 It is important to understand that drinking alcohol during pregnancy can hurt the unborn child. I think it is very important to sensitize mothers, parents and people in general, not to drink alcohol during pregnancy for the sake of the health of the unborn child. We hope to make people believe in the project and to understand the message as clearly as possible. We also hope that families will spread this information. For moms this is the message: do not drink alcohol during pregnancy, not even for a toast. Sometimes people say that drinking a few glasses does nothing, this is not true. Family and friends, please collaborate with mothers in order to help pursue this goal. 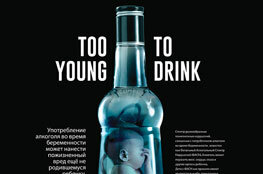 I hope that people will talk about this problem, that can happen when a mother drink alcohol during pregnancy. Just the fact that we are speaking about it, it means the campaign has achieved a great success. My name is Erik Ravelo, and I am responsible for Social Engagement Campaigns at Fabrica. We are here to present our new campaign to raise awareness about not drinking alcohol during pregnancy. Mum drinks, baby drinks (“Mamma Beve Bimbo Beve”), the campaign we launched few years ago, has been a great success. This year the goal is to develop an international campaign. We were inspired by the traditional drinks of each country: brandy from the Balkans, the French champagne, Italian wine, the English and Irish whiskey, and Vodka of Eastern Europe. 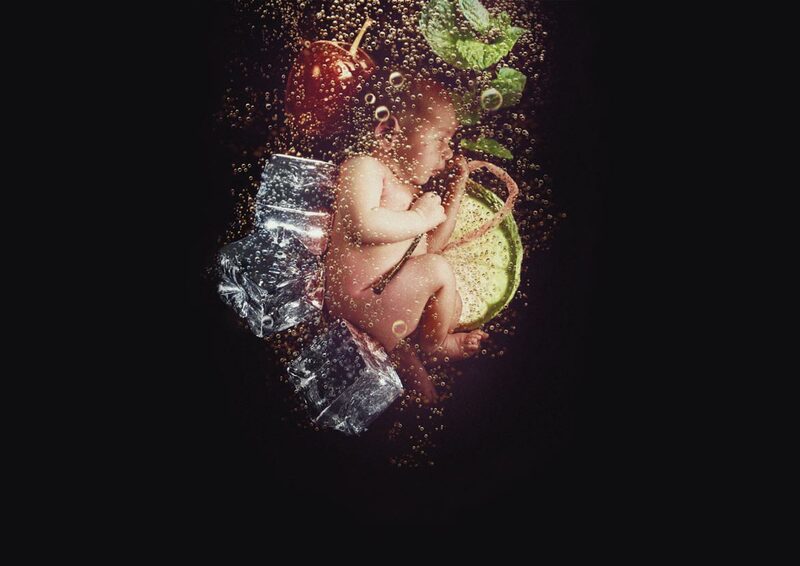 We have worked with the eternal concept of the unborn child who, instead of being in the belly, is immersed in alcohol. The Fabrica photographers took a picture of a real baby in our studio. The post-production of the campaign was made entirely in-house, from start to finish. For us to convey such a sensitive and touching message is a big challenge. We have been asked to do a campaign that can shake people. Fabrica has always been very interested in helping those associations who may not have the means to develop a campaign like this. It is a great pleasure for Fabrica to help in creating a strong message, that can reach as many people as possible.